We stock 5 shaft lengths of UTS German EYE SHAFT quartz clock movement which will cover the thickness of most dials from 1 to 19mm. These clock movements are all RoHs approved and made in the Black Forest. The hand fitting is euro eye shaft fit. For hands see the section hands for German eye shaft clock movements. FOR QUANTITIES GREATER THAN 200 PCS PLEASE CALL FOR A QUOTE. 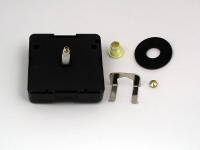 German made quartz clock movement supplied with fittings. These movements are very quiet and take AA batteries, order separately under tools. These movements will drive hands up to around 150mm (min) from our list. Longer hands will need High Torque movements available under specialist clock movements. These movements are very quiet and take an AA batteries, order separately under tools.